"Can you cut this fruit for us?" "and can you make the Bunnies?" this is so cute. i love the bunny apple slices! Soooooooooo cute. I've never seen an apple cut like that. kisses and congratulations! I love a lot your blog and this guys! cute bunnie cut!! simply cute ever!! Oh wow, I've never seen apples turn into bunnies before. Now, i want this in all .-. ps. check out my cute print giveaway!! My mo used to cut apples like that for us too. This made me genuinely smile and I have had a terrible week. OMG! so cute! I made bunny biscuits today but these are alot healthier ... Gosh, I just love this blog. I love these guys, they are always so funny and cute to watch! So cute! I've never seen apples cut like that before. Love ickle's little smile at the end, too. 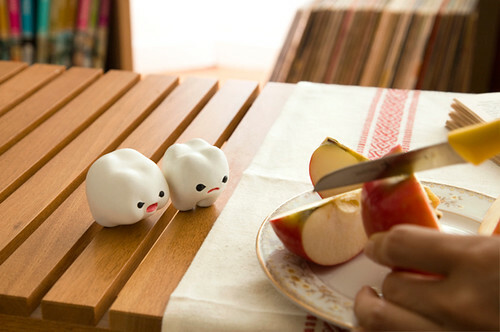 I totally want apple bunnies now! What a cute comic! I'll try asap with my own ickle and Lardee : my sons. Awww, this is so cute ! 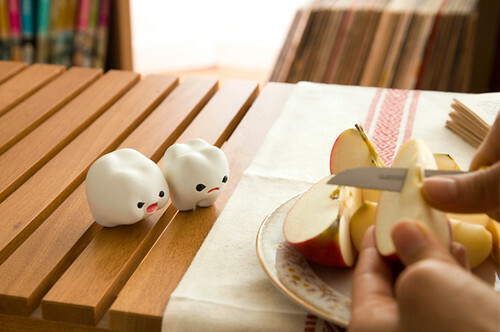 And an excellent idea to cut apples. =) I like it ! This is too adorable for words! I just rediscovered your blog and I really don't know why I lived without it for so long. Aaaw, this is so cute! :D Love the little bunnies. 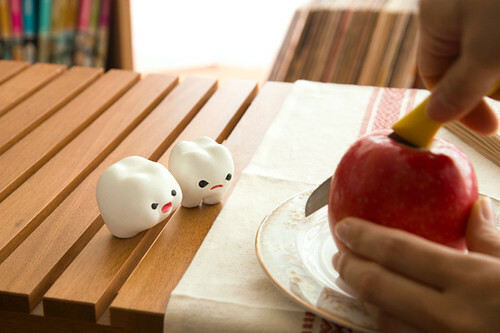 So sweet i will start cutting my apples like bunnies now for sure! I adore your blog it's so lovely! wow that's so awesome I've never seen bunny apples! Aww that is so amazing and adorably cute!! I've been following your blog for some time . Just want to say your work is outstanding! We bought the book and love it, no surprise! I think our little guy will like bunny apple slices. i want bunny apples too!!! nice! this is so cute! SQUEE!! I eat apples every morning at breakfast! This is how I'll have to have them next! So cute! amazing! I hope I'll get some bunnies soon! 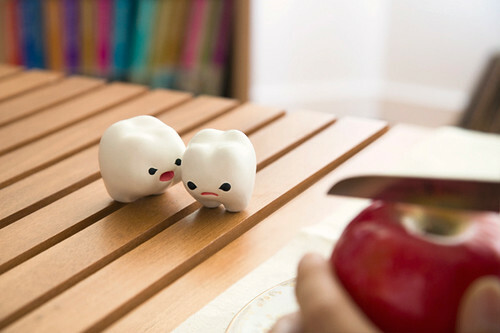 haha cute^^ I love you blog! Cute! 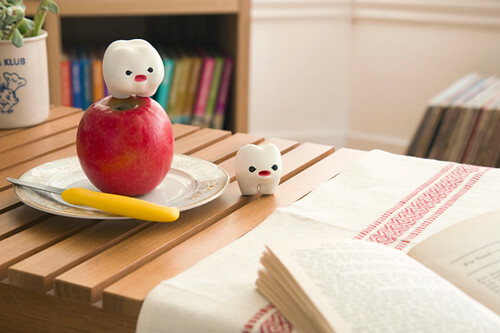 I´m gonna make apples like that every morning! To myself! I just came from Barnes and nobles, and I found your book over there. It melted me instantly and I ended up buying it for myself as my first mother's day gift!! What a talented person you're, these two little things are so cute, I should have them in my house like collectible miniatures..
oh this makes me so happy!! growing up, every night my mom would cut me an apple as a night time snack and the best days was when she would cut them into bunnies like you did for ickle and lardee. "Hehe... Ickle's little smile in the last shot is priceless." Thank you for making my day, specially as I am an apple-fan, too. this is really cute! 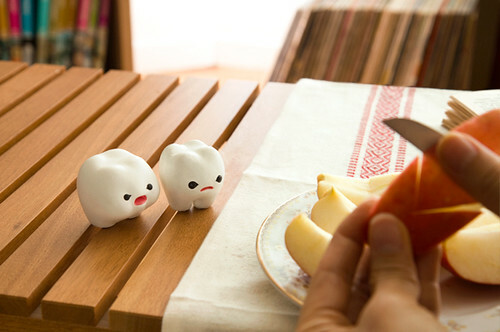 i should try cutting apples this way too! I'm going to use this and tickle a smile out of my little girl today! this nice idea made me cut the apples like bunnies for the kids. They loved it and the little 3yearsold ate 2 apples!! MEGA cute. 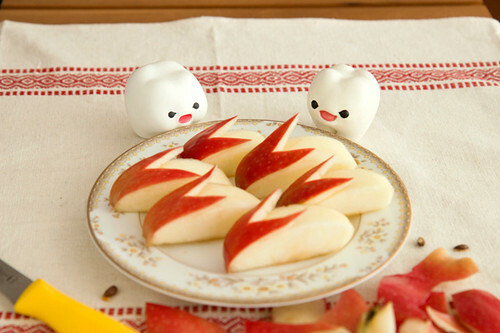 Now I want bunny apple slices too! And keep you awesome work up! I'm kind of nuts about this blog!!! Cute blog! ;) i just love those teeth!!! That's incredibly cute. I wonder how you make the faces. Keep it up. OMG! This blog is sooooo cute! following immediately. thanks very much for a so delicious and funny snack idea!! 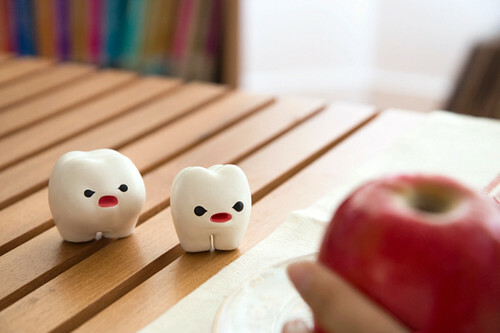 :D now i eat applebunnies almoust every day! Can't be more beautiful stories, the truth is the most original blog I've ever seen. I just love your teeth, Ickle and Lardee =) I hope that it is okay that i borrowed a few of your photos for inspiration on my blog =) It is linked back to you! I saw your book at a local store today, and it was the cutest thing I've seen in ages. I am officially hooked. Even the way you cut apples is amazing. That's the sign of true talent right there. What a special way of cutting an apple! Will try it out, my 4 yr old will love it ;) Love your blog to bits by the way! This is definitely the best blog I have ever come across. I adore the teeth, and those apple bunny pieces are adorable. I'm going to try and make them now! So cute!! I want slices of bunny apples too! haha nom nom! Oh WOW! I have never seen an apple cut so intricately before! i have never seen the Bunnies before! LOVED IT! I made these for my preschoolers today for snack. They LOVED them! Thanks for the idea! Ahh! I love apple bunnies!